If this is your first visit to our site, we welcome you to the reunion of both the houses of Israel, to the place where the two sticks of Ephraim and Judah—and their companions—are being made one stick in the Father’s hand! (Isaiah 8:14; Ezekiel 37:15-28). We desire to see all Israel be restored in the Messiah. Our hope is to bring great and wonderful changes to Ephraim, to non-Jewish Israel, and to help them be a blessing to their Jewish brothers. In this way, we seek to help build up the Father’s two chosen families, to help them to know that He has not forsaken nor forgotten either one of them—and that He never will! (Jeremiah 33:24-26). If you have felt a stirring in your spirit about “your Hebrew roots,” if you have felt drawn to celebrate the Sabbath and the feasts of Israel, or felt an unexplainable love for the Jewish people, then we suggest that you too are part of this rebuilding and restoring work the Father is doing in this hour. Who is this people who are now being restored to many of the ancient truths of Scripture? Long ago the Father divided Israel into two houses: Ephraim (Israel) and Judah. Those of the Northern Kingdom of Ephraim, or Israel, were destined to become a scattered “melo hagoyim,” a “fullness of the nations,” and to one day be regathered and become “Sons of the Living God.” These two houses of Israel have been “two witnesses” for the God of Israel, they have been witnessing to His twin truths of Law and Grace. YHVH scattered His two houses in two different directions to accomplish two different purposes; and, in this last day He would have them, and their companions, come together, that they might confirm His truth in the earth (Genesis 48:19; 1 Kings 12:15,24; Hosea 1:10-11; John 8:17; Romans 9:26). We believe we are the beginnings of that reunited and restored people, and we seek to be better witnesses for YHVH’s eternal truths. We desire to be a people who actually walk in His life-giving truths. We pray that this also is your desire. We invite you to participate in our Talk Groups, to read the many articles that we offer, and to register to receive a free sample Herald Newsletter and regular email updates. 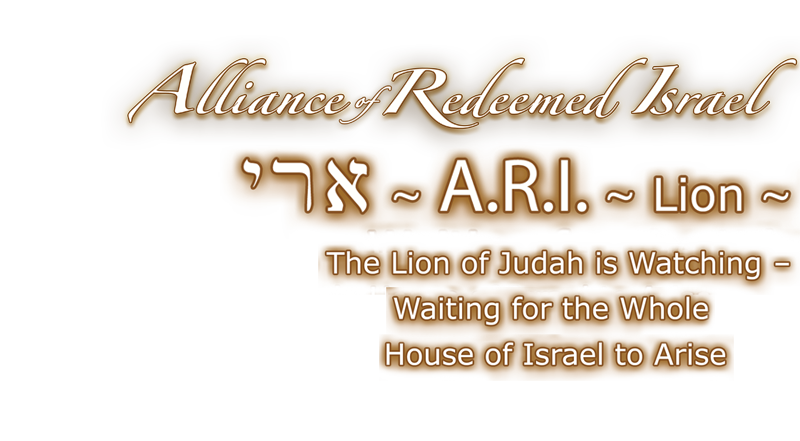 If you are looking for fellowship, check out our ever-growing Alliance of Redeemed Israel Directory. We also hope you will attend one of our Gatherings. Our get-togethers offer inspiring teachings and glorious worship. You don’t want to miss them, and we don’t want to miss the chance to meet you! We hope you will register as a Guest so we can keep you updated on new developments. We invite you to visit often and become an integral part of this cutting-edge restoration movement. If you feel that you are not ready to decide about ARI and simply want to receive email updates, we invite you to sign our Guest Book. If you are in agreement with our beliefs (see “The Hope of Redeemed Israel”), we invite you join the Alliance of Redeemed Israel. ARI is a growing group of people who love the God of Israel and want to serve His purposes in this hour. We hope we can count on you being among our ranks. Click here for the new book!